The Link to List addon tool helps you sync your email newsletter to your subscriber lists. This means that when someone clicks on a link in your email, you're able to assign them automatically to a specific list. The potential for deepening your engagement is huge, allowing you to target your most engaged readers, sync further with an Autoresponder, and more! Click on Addons, at the top of your screen. Then select Add more. Scroll to the Link to List feature, and turn it on. You'll see a message that You're all set! and that's it! 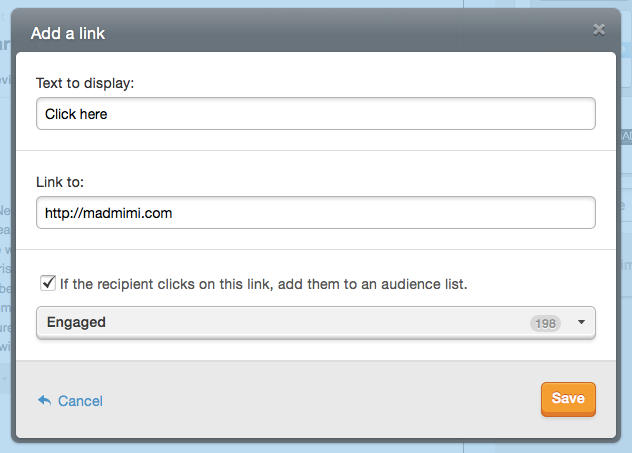 In the Email Composer, highlight the text you want as your link, and click the link tool. Now you'll see an extra option! Underneath the field for the link URL, you can now assign that link to a specific email list. Make sure you've added in a place for the link to go (the link URL), and tick that checkbox. Note: You must include a destination for this link, or it will not function properly. Select the list you want your clickers to be added to, and that's it! Note: For more specific help on creating a reconfirmation email, using Link to List, look here. How Do I Add Standard Links to my Campaign? Where can I see contacts that clicked my links? Can I View Lists From Stats, Or Export Stats?